Deep-fried homemade spring rolls stuffed with sautéed ground pork, shrimps, and mixed ingredients served with sweet and sour sauce. Deep-fried large spring rolls stuffed with sautéed ground pork and mixed vegetables; served with garlic vinaigrette sauce. Deep-fried black tiger shrimps in light batter served with authentic Japanese dipping sauce. Deep-fried, lightly battered squid served with Asian vinaigrette sauce. Deep-fried savory pork ruffles served with soy-vinegar sauce. Chicken with chayote and spinach simmered in ginger broth. Tender baby back ribs simmered with mixed Asian vegetables in tangy tamarind broth. Fresh salmon and shrimps with Asian vegetables and shiro miso simmered in tamarind broth. Milkfish belly simmered in tamarind broth with Asian veggies. Beef shank and bone marrow simmered slowly till tender with mixed Asian vegetables, carrots and corn. Our signature soup with tender oxtail meat slowly simmered in our homemade broth with shitake mushrooms and peanuts served with Aloha ginger soy sauce. Fresh spinach and tofu sautéed with garlic. Pan-fried rice noodles (bihon) and egg noodles (miki) with sliced chicken, shrimps and mixed vegetables. Stir-fried wheat noodles with pork, shrimps and mixed vegetables. Pan-fried egg noodles with shrimps, sliced chicken and mixed vegetables sautéed in Japanese yakisoba sauce. Grilled marinated pork belly served with Asian vinaigrette sauce, tomatoes and cucumber on the side. 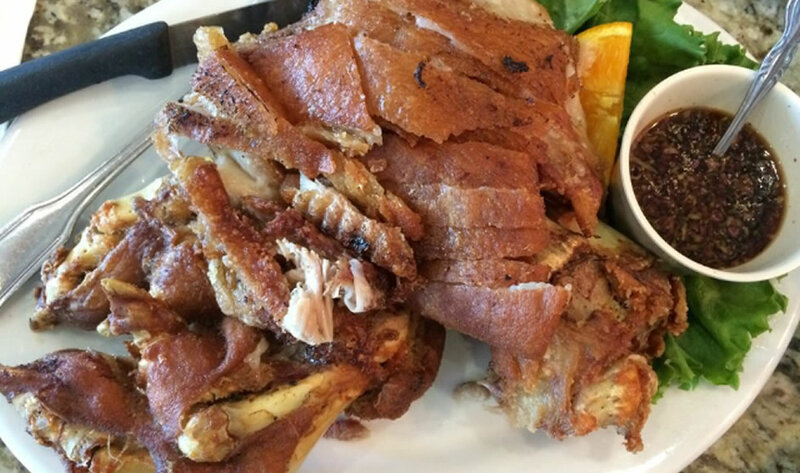 Seasoned crispy deep-fried pork belly served with lechon sauce, tomatoes and cucumber on the side. Chicken, pork ribs and potatoes simmered in soy sauce, vinegar and garlic. 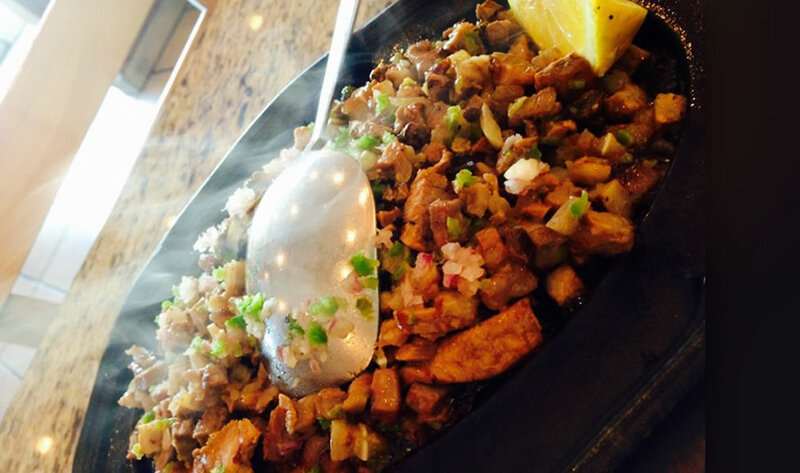 Grilled pork chopped in small pieces then sautéed with onions, jalapeno peppers and special sauce served on a sizzling plate. Deep-fried Japanese panko-crusted tilapia fillet topped with our homemade tartar sauce and tropical salsa. Deep-fried marinated boneless milkfish topped with diced tomatoes, onions and cilantro served with Asian vinaigrette sauce. Tender slices of rib-eye beef cooked in soy sauce and lemon sautéed with yellow and red onions. Braised oxtail and tripe with mixed vegetables cooked in creamy peanut sauce served with sautéed shrimp paste (bagoong) on the side. Deep-fried spring chicken to golden crisp with special mixed seasoning served with sweet raspberry chipotle sauce,tomatoes and cucumber on the side. Grilled marinated spring chicken brushed with our own special barbecue sauce served with tomatoes and cucumber on the side. Our signature black fried rice with shrimps, scallops, snow crab meat and specialingredients topped with crispy calamares, musselsand green peas. Fried rice with chopped pork cooked in shrimp paste topped with diced mango,tomatoes, red & green onions and scrambled egg. Fried rice with real snow crab meat, shrimps and scrambled egg topped with green onion. Our signature black fried rice with shrimps, scallops, snow crab meat and specialingredients topped with crispy calamares, mussels and green peas. Succulent jumbo prawns and scallops sautéed in wine, garlic and button mushrooms. Grilled fresh fillet of Atlantic salmon served with our own maple-ginger sauce over a bed of sautéed spinach. Parboiled medium-sized shrimps then stir-fried with fresh garlic butter and our own spicy Cajun sauce. Sliced beef tongue with button mushrooms in white creamy sauce. Sliced beef tongue with button mushrooms in tomato sauce and green olives. Boneless milkfish sautéed with onions, jalapeno peppers and mixed seasoning served on a sizzling plate. 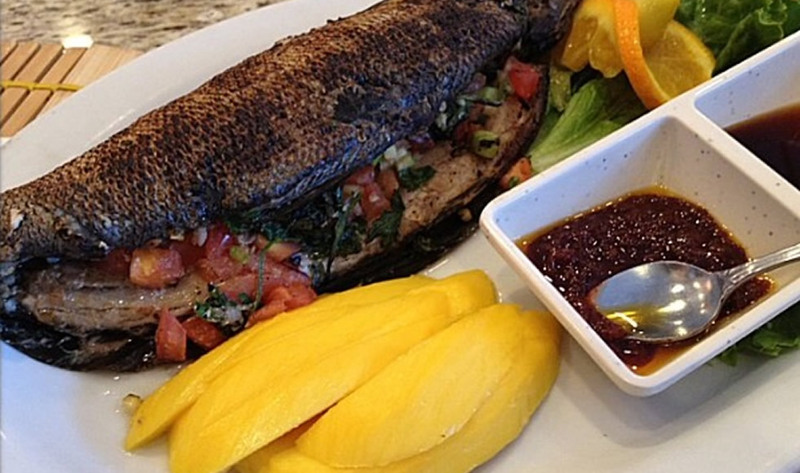 Whole boneless milkfish stuffed with tomatoes, and onions grilled to perfection served with sliced mango and bagoong. Lightly battered jumbo-sized soft shell crabs topped with garlic, crab paste and mixed ingredients served on a sizzling plate. Grilled yellow tail collar bone from Japan served with seaweed salad and special vinaigrette sauce. Choice rib-eye beef grilled to your liking topped with sautéed button and shitake mushrooms in Japanese sweet sauce. 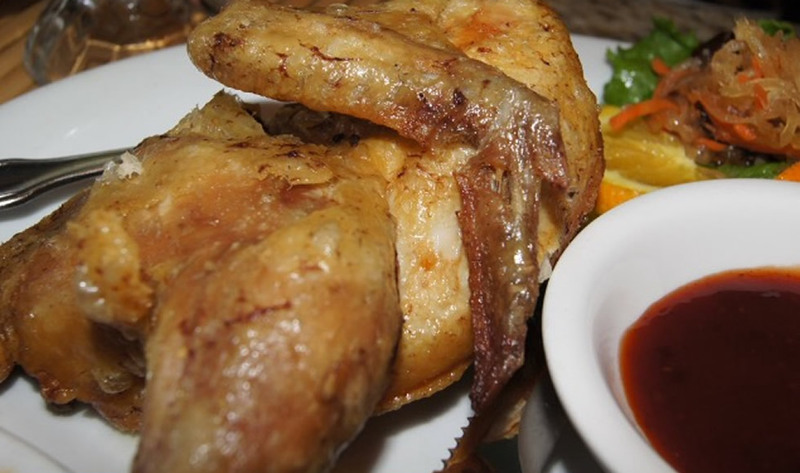 Seasoned, deep-fried pork leg served with special Asian vinaigrette sauce. Slowly cooked whole pork leg smothered with our homemade sauce topped with shitake mushroom and bokchoy. Choice Rib-eye beef topped with our own Hawaiian teriyaki sauce served with sautéed mixed veggies and steamed rice. Fresh Atlantic salmon fillet topped with maple-ginger sauce served with sautéed mixed veggies and steamed rice. Seasoned crispy deep-fried pork belly served with steamed rice, lechon sauce, tomatoes and cucumber on the side. Chicken or pork ribs simmered in soy sauce, vinegar, and garlic served with steamed rice. Deep-fried spring chicken to golden crisp with special mixed seasoning served with Java rice, tomatoes & cucumber on the side. Grilled marinated spring chicken brushed with our own special barbecue sauce served with Java rice, tomatoes & cucumber on the side. Pan-fried rice stick (bihon) and egg noodles (miki) with sliced chicken, shrimps, and mixed vegetables. Stir-fried mixed fresh vegetables in season with sliced chicken or shrimps, served with steamed rice. Tender baby back ribs or shrimps simmered in tamarind broth with Asian vegetables served with steamed rice. Our signature soup with tender oxtail meat slowly simmered in our homemade broth with shitake mushrooms & peanuts served with steamed rice and Aloha ginger soy sauce on the side. 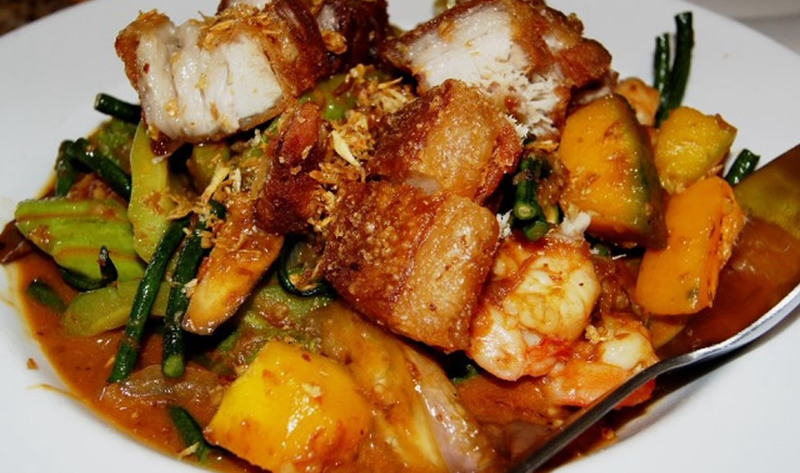 Braised oxtail and tripe with mixed vegetables cooked in creamy peanut sauce served with steamed rice and shrimp paste on the side. 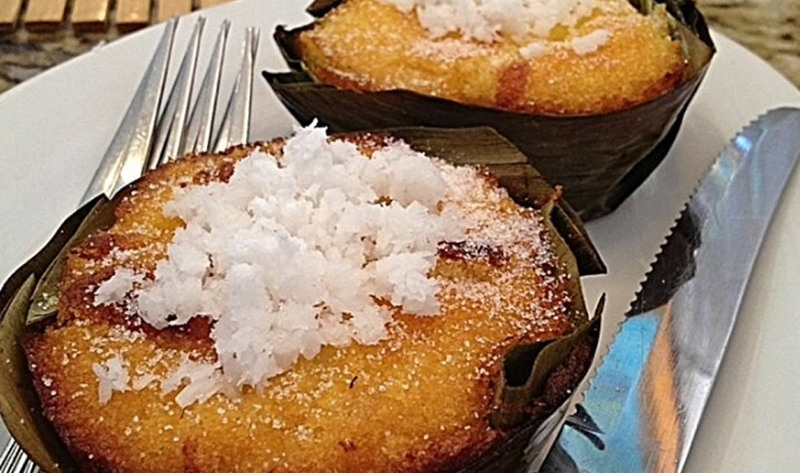 Freshly baked mini-bibingka with cheese and salted egg topped with grated coconut and sprinkled with sugar. Shaved ice with homemade sweetened bananas, ube, jackfruit, gelatin, nata de coco, and young coconut topped with leche flan, ube jalaya, pinipig. Regular halo-halo with your choice of a scoop of ice cream (ube, mango, or buko pandan).